Key Elements of the Master Plan: The key elements of the plan are based on needs specific to the members of Saint Paul’s and the constraints and opportunities inherent in the site. 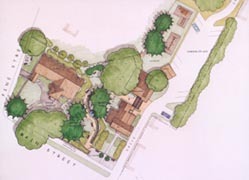 These elements include those that relate to the memorial garden as well as those that encompass the whole site. The Master Plan focuses on clarity, function and elegance to create a coherent and comfortable design that will serve the needs of the parish into the future while retaining ties with the past. Analysis of character zones: The site has extensive beauty but its many “faces” and functions create confusion and disrupt harmony. Mature trees play a major role in site character, determining areas of sun and shade and defining outdoor rooms. Existing surface drainage carries water away from the buildings to the back of the property. 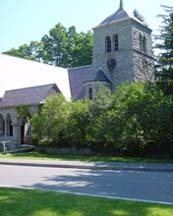 St. Paul’s Episcopal Church, a fine, early McKim, Mead and White building, sits on a busy corner of the Main Street of Stockbridge. Along with its rectory and parish house and a buffer of healthy mature trees it is partially surrounded by a low stonewall. The setting is sheltered and serene in spite of the nearby bustle of town activities. The need for specific repairs and additions to buildings and grounds and the desire for a memorial garden with space for the interment of remains suggested that the time was right for a complete Master Plan for the property. This encompassing plan addresses relationships with adjacent properties, pedestrian and vehicular circulation, handicap pedestrian access, views, privacy, planting, parking, character and lighting. 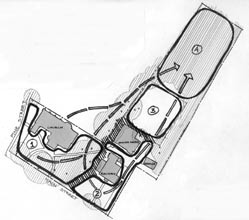 The plan’s focal point, a low curving memorial wall, runs through a central contemplative garden. 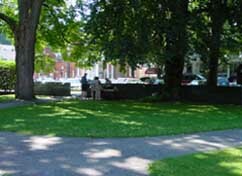 It defines both the shape of the garden as well as the division between public and private space. The complexities and challenges of linking the constrained spaces to serve multiple uses while maintaining and increasing the sense of shelter and serenity was addressed in the plan in an elegant and simple way. The need for privacy and quiet reflection was balanced with the Church’s function as a welcoming public space. 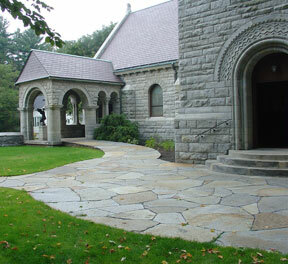 The handsome stone church required an elegant design response using similar materials. 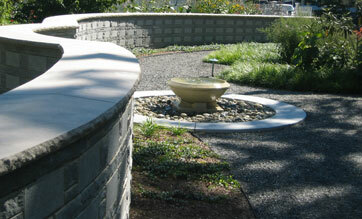 Memorial Wall: Simple and elegant in form, the linear design of the memorial wall provides space for individual plots. Integrated design The new site plan provides a fully accessible entry to the historic stone church while reflecting its traditional design and material. Site Assets: Mature trees create dappled shade and a sense of enclosure within the existing stone perimeter wall, a welcome contrast to the busy, adjacent Main Street.